Boy Elephant Raffle Tickets are very polite way to encourage your guests to bring the diapers for a baby on the way! Diaper Raffle game will need to be planned ahead so that guests know to bring a package of diapers if they choose to participate to win a PRIZE. ✔10 Boy Elephant Printable Diaper Raffle Tickets in 1 .PDF file - each 2" wide x 3,5" high (something like the size of the business card). You can print as many as you need. ⓟPERSONALIZATION: These Boy Elephant diaper raffle tickets can be personalized with NAME and you can have a custom text for an extra charge - please contact us prior to the order for a quote/price. 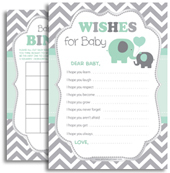 ✄Diaper Tickets ideally are designed to be printed on a white cardstock paper yet you can use a regular paper. Many people distribute the diaper raffle tickets at the same time as invitation.